So far I have shared how to listen to voicemail in Gmail and receive email notifications of voicemail. Now it's time to learn how to check your voicemail from other phones. The first thing you have to do in order to check voicemail from another phone is to add that phone as a forwarding phone. You can change the schedule of the forwarding in such a way that the calls actually don't forward, for example only forward from 9:00 PM to 9:00 PM on the same day. See here for instructions on setting up the call forwarding. Once you have the call forwarding number set up, you need to determine if this phone will be one that you want to check voicemail from. In order to do this, go back into the Google Voice by going to fi.google.com scroll to the bottom and click on Google Voice. Once on the Google Voice page, go to settings under the Gear icon in the top right and then make sure you are on the Phones tab. Under the phone you added for forwarding, select Edit and then Show Advanced Settings link to show the screen to the right. 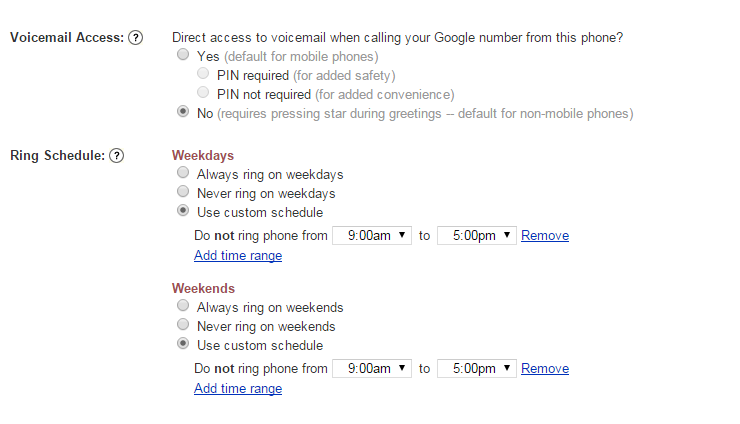 At the top you see the options for voicemail access. 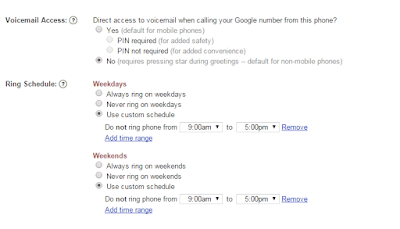 If you opt to require a pin, you will need to set this up back at fi.google.com, scroll down to settings, and choose voicemail. Here you will have the option to set your pin by turning it on and entering the pin of your choice. Personally, given the fact that I can get my voicemail via email with transcription, and never am without my phone, I do not use this feature. However, I can see where some people would benefit from having this available. Why are you making it so hard? When it asks for your forward number just type in your Project Fi number. Note this does not work if forwarding to a Sprint cell number that's forwarded to GV., either using the native PΦ interface or the GV interface shown above. In such case, you could only access PΦ voice mail from aforesaid Sprint cell (or its GV outbound instantiation) if VM pin is disabled.